Old and leaning tombstones at Wood Lake Lutheran of Deuel County. 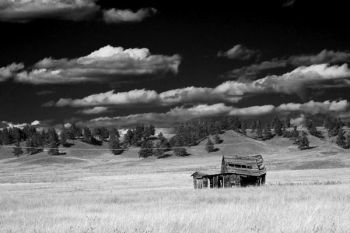 Abandonded ranch near Thunder Butte in Ziebach County. Abandoned business buildings of Dewey in southwest Custer County. 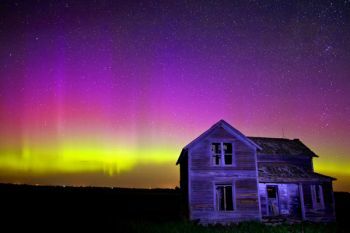 Northern lights above an abandoned farm house in McCook County. The rising moon as seen from a church yard in Lincoln County. 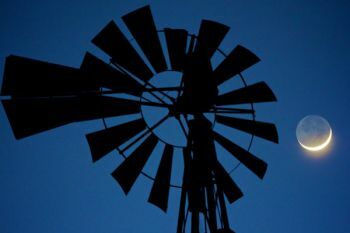 An old windmill with a crescent moon in Turner County. 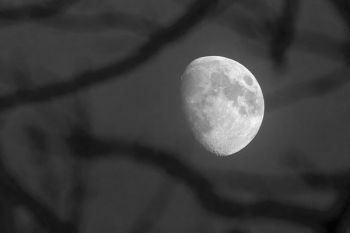 The rising moon through tree branches in Turner County. 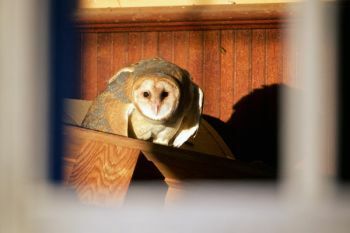 A barn owl in an abandoned building found in Fall River County. 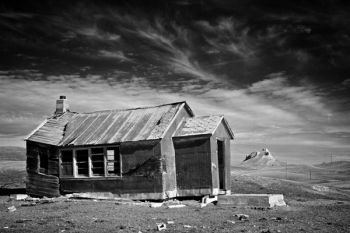 An abandoned schoolhouse with Castle Butte in the distance in Butte County. 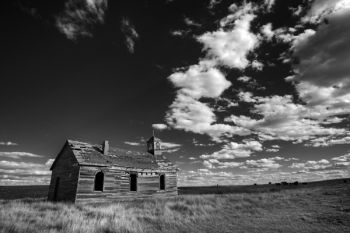 Alone on the prairies of southwestern Custer County. Abandoned in northern Marshall County. The old Korb residence just outside of Isabel in Dewey County. 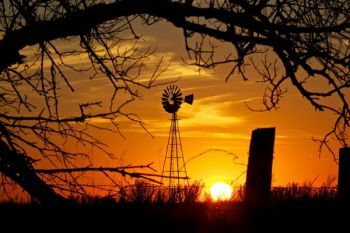 The setting sun in a tangle of barbed wire and tree branches in Turner County. 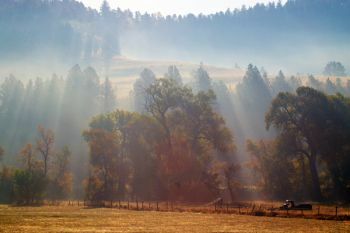 Early morning fog in eastern Custer County. 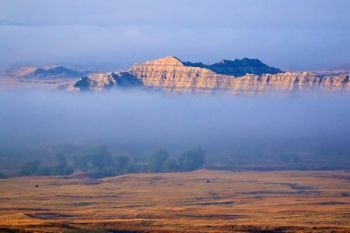 Low lying fog in the Sage Creek Wilderness of Badlands National Park. The standing remains of Holy Family Church in Mellete County, where I had a heart stopping encounter with a large rattlesnake. 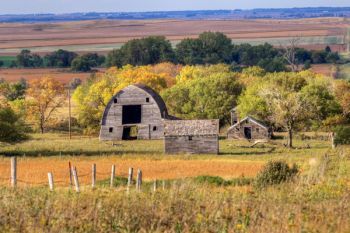 I’ve spent a lot of time alone wandering the back roads of South Dakota. 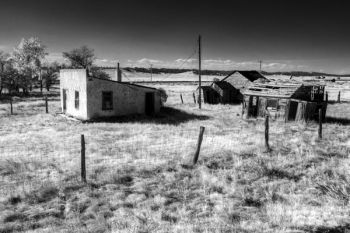 Like many photographers, I’ve been attracted to ghost towns and abandoned structures. 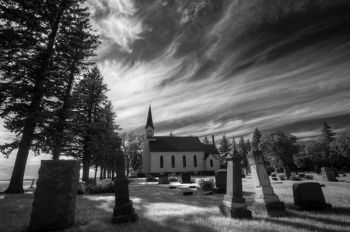 I’ve also spent hours in church yards next to tombstones, shooting the stars as they wheel around church steeples. There are times when I have to truly focus on what I’m doing and not let my imagination wander. If I don’t, random ghost stories float like faint apparations into my mind. And I’ve heard some good ones. Over the last few years, I’ve been truly terrified a total of three times while shooting photos. Each instance was more about unexpected situations than anything unexplained, but as any good horror film director knows, the unexpected is what frightens the best. 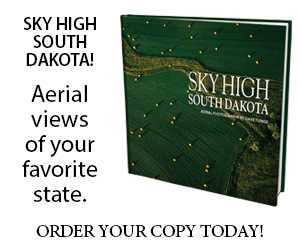 In my case, the unexpected was South Dakota’s wildlife. I unknowingly stepped on a slumbering hen pheasant in tall grass along the Grand River one foggy spring morning. I don’t know whose noise was worse, the pheasant’s or mine. Later that summer, I was walking the hills above Lake Hiddenwood when I nearly stepped on a white-tail fawn hidden in the grass. When it jumped up and bounded away, I admit to letting out a sound that resembled more of a squeal than a warrior’s battle cry. The last instance happened while shooting an abandoned church in Mellette County. I walked up to the steps, slowly scanning all around for anything that might jump out. I didn’t see anything until my first step up the concrete steps. One of the largest rattlesnakes I’d seen in some time buzzed as loud as I’ve ever heard, and my heart was instantly in my throat as I fell back hollering in fear and surprise. Because of these experiences, I’ve learned to make plenty of noise while approaching structures or places that could hide wildlife. In September, this tactic actually worked. I was stomping and talking out loud to myself while approaching an abandoned building when I started to hear scratching inside. I froze. The last thing I wanted was a rabid skunk or something worse coming out. Strangely, the scratching ascended the inside walls and soon a ghostly face was staring at me through the broken window. I had awoken three barn owls, and two them were climbing the walls to see what all the ruckus was about. I went to get my long lens from my vehicle, and the climbing owls took the opportunity to vacate the building. It was my first time seeing barn owls. These guys are spooky. They hiss and scratch and have a very odd defensive response that I witnessed when I came back with my telephoto lens. The big female had remained inside. It bowed in my direction with its wings out, as if opening a cape, and then slowly shook its head back and forth. Then she slowly raised her head again, gave me a long look and then started bowing again. It was one of the strangest and creepiest things I’ve ever seen a wild animal do. I later read that Native Americans called them ghost owls, and I can understand why. One doesn’t have to seek out owls to shoot photographs that fit the Halloween season. 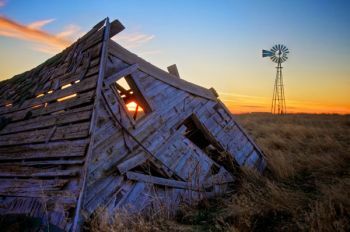 South Dakota has many abandoned structures across the countryside. I wouldn’t enter any without first getting the landowner’s permission. 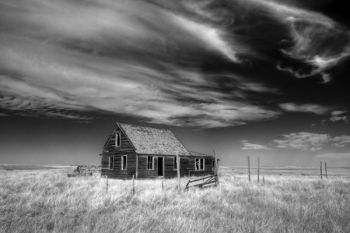 Shooting from the road is often all you need to capture the lonesome buildings against an expansive sky. 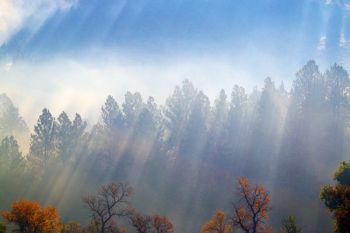 Capturing photos of uncommon weather phenonoma like fog or even the northern lights can also evoke strange and beautiful images. 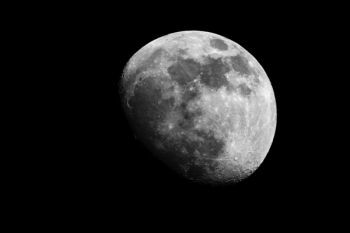 The moon in its various phases is another good subject. I like to shoot it framed with things like gnarled tree branches if possible. Another trick is to shoot in the early evening while there are still blue skies. Then, using the black and white filters in your editing software, you can turn that blue to black for a more stark rendering. Whether you are shooting the moon, seeking owls or simply keeping your little ones safe as they empty the neighbor’s candy buckets, here’s to a safe and fun Halloween. 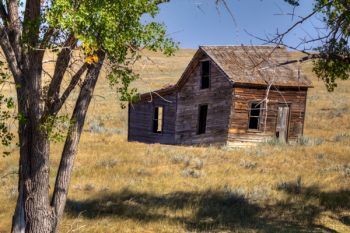 And if you want a creepy, true Halloween story, read this from Mike Crowley’s blog about Thunder Butte. I have to stop myself from thinking about it when I’m out and alone in the South Dakota night. Heidi, you mock my near escape with certain death... Um, Ok maybe not, but anything can be scary when it unexpectedly jumps up right in front of you. Even Bambi.